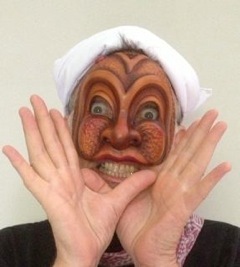 Typifying Commedia's attention to status all the way to the bottom; the principle Zannis; Brighella and Arlecchino were from upper and lower Bergamot respectively. Brighella often cited this as vindication for his superiority over his lower village mate. Brighella was at times portrayed as a sly, streetwise but lazy "Alpha" clown, sometimes a gifted musician with a cat-like countenance. The Brighella masks shown are also available in Green. Arlecchino was a naive, acrobatic, magical hero of the Italian Commedy. A "Stan Laurel" to Brighella's "Oliver Hardy", his patchwork suit and Carbunkled mask became a trademark of the early theatre "The Harlequin". 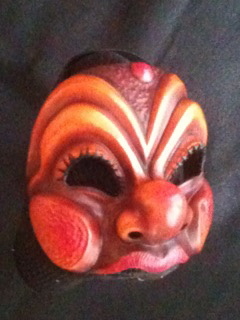 The Arlecchino masks may be ordered as shown, all Black or Dark Brown.